Following their recent defeat on the shores of the Empire the Nauticans look West for a safer land fall and a haven from the Daemonic Hordes ravaging the ocean deep. In their last outing the Nauticans were bested by mortars, missile fire and the Colleges of Magic as they tried to establish a foothold in the coastal shores of Karl Franz's Empire. They now turn their attention elsewhere and will soon be facing the cold, emotionless Lizardmen in the humid shoreline jungles of the continent of Lustria - a damp environment much more to the Nauticans liking. 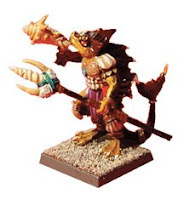 Well folks, this time I'm the Nauticans and my friend is bringing his new lizardmen army to the party and I'm planning on kicking his reptilian backside back into the swamps ! I'm expecting Stegs and loads of Temple Guard if I know my friend. He likes "boots on the ground" and strong/tough units. He's not a fan of magic but I'm wondering if the power of the Ancients will change his mind. Anyway, I'm working on my army list and will get back to you shortly with my thoughts and ideas. Of course, in case my enemy is reading this... I could always be double-bluffing !